It's traditionally sung a cappella—no instruments, just voices mingled together in magnificent harmony. As Fellows, we often sing the doxology in the context of community. On Sunday mornings, we sing it with the rest of the Trinity congregation during church, hundreds of people of all backgrounds and ages and stories fulfilling the call for all God’s “creatures here below” to praise Him. And each Monday night, at the end of the Fellows’ weekly Roundtable dinner—our time of fellowship and processing—we gather in a circle, arms around one another, and sing the doxology in unison. Slowly but surely, the doxology is becoming the soundtrack to my year as a Fellow. Each time I sing that now-familiar first note, my heart feels like it’s at home. This practice of singing the doxology has begun to shape me. It’s a song that has drawn me into worship and to the truth about who God is. Many times over the past four months, when I’ve felt worn out and at the end of my rope, I’ve sung the doxology over myself, knowing full well the way that these lyrics can nudge me out of despair and into trusting God. One Thursday afternoon, after watching a heart-wrenching film in class about AIDS that left me sobbing, I drove away from class drained and distraught. As I drove down the highway, I made myself breathe out one verse of the doxology at a time, my heart calming with each line. Praise Him, all creatures here below. Praise Him above, ye heavenly host. Praise Father, Son, and Holy Ghost. He’s worthy of praise, I’m reminded—even when the world seems overwhelming. And some days this year, I’ve simply been exhausted. Some days, the to-do lists feel long, the scheduled activities get stacked, the margin that I long for seems nowhere to be found. When I’ve been weary and worn down, it’s been tempting to fall into bitterness and to complain, despite the fact that each aspect and activity of life as a Fellow is genuinely good. So in the car driving from tutoring to class, or from work to Roundtable, or even during the 30-second walk to my car through the church parking lot, I have sung the doxology, the first line teaching and re-teaching me the rhythm of gratitude. Praise God from whom all blessings flow. There’s so much to thank Him for, even on the hard days. The doxology has also gently but firmly reminded me that every good and perfect gift comes from God above (James 1:17). In a year that has been abundantly wonderful, it has been tempting to merely enjoy the good parts of the Fellows program without turning in adoration and thanksgiving to God. The doxology has taught me the rhythm of looking out and then looking up, helping me to see the blessings that have flowed to me, and then turning my heart upward in light of them to God. After a particularly sweet December night spent drinking hot chocolate by the fire with my beloved Fellow friends, I walked out to my car, and, awestruck by the starlit sky, instinctively began singing the doxology out loud. A few others heard me and joined in, our simple harmony echoing down the driveway. Praise God from whom all blessings flow. In that moment, the doxology’s lyrics reminded me that the gifts of community and natural beauty flow from the God who is somehow even more wonderful than those gifts. As Fr. Richard Rohr says, "Whatever good, true, or beautiful things we can say about humanity or creation we can say of God exponentially. God is the beauty of creation and humanity multiplied to the infinite power." His bright glory and goodness is reflected in the parts of this year I’ve treasured most. Looking ahead to the remaining five months of the Trinity Fellows Program, I know that every Sunday morning, every Monday evening, and plenty of moments in between, I will be singing the doxology. The coming days and weeks will bring with them a multitude of challenges and joys, gifts and pain, but I hope that the doxology’s rhythm of praise and gratitude will define my Fellows year and the years to come. Nikki has a background in marketing and communications and is interested in the convergence of faith, media, and culture. She has held marketing internships at various local and international organizations, including a magazine publishing company in Charlottesville. Nikki also worked as a member of the team that helped with the recent launch of The Arbor, a Charlottesville based nonprofit organization that seeks the flourishing of survivors of human trafficking. During college, she was involved in leadership in Chi Alpha at UVA, and worked as a youth counselor at Yosemite Sierra Summer Camp in California. She is considering a career in communications. The Trinity Fellows Program, in my experience, has been painful. It has been many other things—exciting and beautiful and strange—but for me, it has been undeniably painful. I think this is because much of the discussion we’ve had this year has opened old wounds, many of which I wasn’t even aware existed. I have a deep and abiding desire to be special. I know, the word makes me cringe—and I am embarrassed to call it my own. This hunger to be special is, at heart, self-absorption. Over the years, it has become subtle and sometimes sinister, and has at times been mistaken for kindness and caring. I’ve come to believe that self-absorption is at its core self-deification. The desire to be special is really the desire to be admired—which is, when you unravel it enough, the desire to be worshipped. And this tendency toward self-absorption had left me with countless hours of introspection, nursed injuries, incipient hopes, and a smattering of emotion. All I had was a constructed self, a “beautiful” image I could call my own—one that was the work of my own hands. In the past, when people spoke of the Church as the Body of Christ, in which each member was as necessary to the others as hands are to the feet, I shrugged it off as a shallow platitude. It wasn’t sufficient—it couldn’t satisfy my desire to be special, to be unique, to be the recipient of people’s genuine admiration. The most difficult realization I’ve had within the Fellows program has been that I am, indeed, not special. I am not irreplaceable—or even ultimately necessary. This small body of believers does not need me in order to survive. More than that, it does not even need me in order to flourish. Their worship was never mine. And while they are warm, appreciative, and loving, their ultimate admiration is for another. And because of His love, His body broken for them, they worship Him. C.S. Lewis wrote in The Four Loves that “God, who needs nothing, loves into existence wholly superfluous creatures in order that he may love and perfect them.” God’s indomitable love is a relentless and quiet pursuit that both shatters our schemes for autonomy and answers our cries of desperation. It does not pour itself out or break itself open for me because I am special. I am special because this love has been poured out for me. Christ’s love—a love that is radical, intimate and fierce—is the only force I’ve ever felt that can unwrap the self-absorption that is coiled around my heart. It is a love that claims my mind, my spirit and my body. This love boldly claims that I do not belong to myself. I belong to Him whose love is the foundation, the present sustenance and the future hope of my very existence. And it is a love that I have only comprehended by being a member of a community that has fallen in love with the person of Jesus Christ. In this Fellows community, my brothers and sisters are not set on developing their own images but on worshiping and emulating Jesus. This year, I have come to see that declarations about the Body of Christ are not empty promises, but statements of belonging. “I belong to Christ as surely as his pierced feet and hands belonged to him.” The emphasis must not be placed on our necessity to Him or to one another. And our place within the Body is not secured by the insufficiency of the skills we bring to the table. On the contrary, it is because our belonging is superfluous grace that God’s love can be seen. This group of Fellows surely does not need me. But I do belong with them. As with so many insights from Christ’s parables and examples, these facts are counterintuitive. The answer to my desire to be special need not be a suppression of my individuality, nor an endorsement of my ravenous craving to be worshiped, but rather an affirmation of what my deepest, often unsaid hope is: to belong, and in that belonging be united in incredible intimacy with the body of Christ, broken and poured out for me. This mystical union, where oneness can be found in perfect harmony with—even because of—a kaleidoscopic diversity, I have found only amongst my brothers and sisters in the Body of Christ. While at LSU, Micah was in leadership with Reformed University Fellowship (RUF), leading small discussion groups, acting as an RUF spokesperson, and coordinating volunteer service opportunities, including trips to orphanages and children’s homes in Louisiana, Mississippi, Mexico, and China. This instilled in him a desire to serve and educate children in need. He has traveled in the UK, western and central Europe, and Asia. His written work as a contributing author has been published online and in print. He hopes one day to meld his interests in writing, public speaking, counseling, and education into a cohesive vocation. There is something holy about gathering around a table with the ones you love. It is there—around the table—that we look each other full in the face, accepting all of the mess that life with others may bring, bearing together the weight of the day. It is there that we share meals, nourishing our bodies with the carefully crafted food created and served in love. The table is a place for stories told, encouragement given, thanks expressed. And it is at the table where we cease our toil, cast off concerns, abandon false facades, and step into our truest selves. We simply come as we are to be filled. The table is a sacred space, indeed. Bonding through breaking bread together is my favorite component of the Fellows program, specifically during a weekly time called “Roundtable.” It is a couple of hours at the start of the week during which we cook, dine, worship, and pray together as a community of brothers and sisters. It is a place to reconnect after a Monday in the marketplace, to find a sliver of rest in the busyness of our schedules, and to recount all the many ways God has shown up in our lives recently. We demonstrate hospitality, grace, and a whole lot of love to one another, leaving us with both full bellies and full hearts by the end of the night. It is around the table that I am most clearly reminded of why I moved to Charlottesville in the first place—to dwell with God in the context of community. It might be the meal itself that leads us to sit and dine together, but what causes us to return excitedly each week is the doling out of grace when it is needed, the displays of kindness, the meaningful conversations, and the shared desire to enter into each other’s mess and choose to love each other in spite of it. I believe a connection exists between the physical and the spiritual; something as seemingly mundane as slurping soup around the dining room table unites us as a family under one good, good Father—a Father who gently beckons us to draw near with absolutely nothing to offer but our own messed-up selves. And so we are moved to present the same gift to our worn-out and broken-down peers by creating a safe space to simply “be,” safe from the striving and insecurity so frequently elicited by the world. We give grace freely. We embrace and break bread and remember why we do so—because we have first received a grace from the Lord that compels us. This is the Gospel: that while we were still sinners, Christ died for us. That we are so loved that the Son of Man was pleased to lay down His life so that we might have it abundantly, eternally. A passage in Matthew 11 recounts the compassionate call of Jesus: “Come to me, all who labor and are heavy laden, and I will give you rest.” Like little children who depend on their parents for every need, those who pursue Jesus approach the throne with confidence not in their own strength, but based on the sufficiency of Christ’s sacrifice. After all, nothing can separate us from His love; He has made a way for us to approach the table of God, to share in His sufferings and simply come to find the deep soul rest for which we long. This thought is what comes to mind when I consider the not-so-obvious purpose behind our weekly Fellows meal. I believe we can emulate Christ by receiving each other with open arms and a warm plate of cheesy casserole. I view this act of sitting alongside our fellow Fellows as a reflection of the freely given acceptance and love that covers a multitude of sins. By fixing our eyes on the example set by Jesus, someone who allows us—even commands us—to humbly stand before the communion table and remember His body sacrificed and blood shed, we are asked to extend the same grace to our neighbor. We too can invite those who labor and are heavy laden to come and find rest in the peaceful yoke of Christ that we have the ability to embody. To do as Jesus does—to fill the spent and broken with reassurance and fullness—is a beautiful blessing that we have the privilege of bestowing upon others. When a ritual as everyday as gathering together around the table takes place in the name of God, it will be filled with the surpassing peace, presence, and fellowship of Christ—the things for which we truly hunger. Taylor supplemented her academic life by conducting research on adult ADHD, serving at a local non-profit as a tutor for high-risk teens, and participating in a university-led service trip to an impoverished school in Nicaragua. These experiences strengthened her passion for providing support for youth struggling with mental health and behavioral problems. Her undergraduate studies focused on psychology and social work, and she hopes to attend graduate school to pursue a master’s in counseling psychology. Three Ridges Hike, near Charlottesville, VA. Photo by Brittany Fan. Every person around the age of twenty has heard this question (or at least a variation of this question) too many times to count. And hearing this question has always bothered me. I have never known how to answer it, but now, thanks to the Fellows Program, I know exactly what I want to do with my life! I still have no clue what I will be doing with my life—or even what I will be doing the year after my Fellows year—but that’s okay. In my relatively short Fellows experience thus far, I have figured out the reason why I can’t adequately answer this question that has haunted me and every other millennial alike. While it may be true that I am prone to indecision when facing a plethora of choices, that’s not the reason the question is so hard to answer. It is also true that after analyzing the many options at hand, I often don’t find one I deem satisfactory, but that’s not it either. My time in the Fellows Program has helped me realize that what I do on earth matters. What I do can help others flourish. What I do can be Kingdom-building. And the best part is, each and every person’s vocation can, should, and will look different from others’ according to the gifts, passions, and personalities God has uniquely given them. I am not naïve enough to think that just by reframing this question, I will be able to calculate the right answer as if it were a math equation. Now, more than ever, I might be fairly confused about how to approach the future. But in the midst of the swirling tornado of thoughts, ideas, worries, and insecurities inside my head, there is God–crafting a plan for my life that only His perfect timing will unveil. These past two months have not unlocked all of life’s mysteries, and neither will the next seven, but my time as a Trinity Fellow has given me a framework to approach God’s call on my life with confidence. I know that He created and gifted me uniquely, and that He wants to bring about His kingdom here on earth. My fulfillment in life won’t come from crafting an individualistic, inwardly focused plan. My fulfillment will instead come from knowing I am stewarding the gifts God has given me. My life is not all about me, and I shouldn’t treat my vocational calling like it is either. Matthew spent his childhood years in Colombia, South America, and Puerto Rico. At Houghton he was a member of the varsity basketball and soccer teams. His marketing internship at Houghton saw him writing articles for published magazines and increasing the college’s social media presence. Matthew studied abroad in Tanzania and lived with both urban and rural Tanzanian families. He mentored kids at sports and wilderness camps for three years and was an assistant basketball coach at his high school alma mater. Morning on the pier. Deltaville, VA. Photo by Brittany Fan. Usually masked as complaint or self-pity, I said that often during my third year of college as a way to seek praise from others. I can’t say enough wonderful things about my UVA experience and the opportunities I had to be involved. However, I wasn’t immune to the temptation to define myself by leadership positions, organizations that would take up space on a resume, and countless meetings. Although I frantically desired rest, I still craved to have an acceptable answer to the question, “how’s your semester going?” I took pride in having those meetings. And I wanted to talk about my busyness to whoever would listen. Several former fellows and Trinity leaders prepared us for our busy schedules during orientation for the Trinity Fellows Program. We were warned of the temptation to complain about our time. We would fail if we tried to have a separate schedule outside of Fellows. We would likely become overwhelmed at some point. It sounded like we would be getting ourselves into a 9-month-long busy schedule. To some extent, we have--but something about this “busyness” is markedly different. In thinking about my Fellows experience thus far, I feel rested. Sustained. Emboldened, even. Robert explained that we enter God’s rest by recognizing that we are finite and by celebrating God’s provision. During the past six weeks I have been reminded that I am not self-sufficient in my productivity, as God is ripping away the part of my identity that rests in staying busy. (Partly because I’m surrounded by 15 other fellows with the exact same schedule as me). The posture of gratitude so evident in these fellows, my host family, and this congregation as a whole has affected me, and I have begun learning to find rest in the midst of busy circumstances in a culture that struggles to be still. In God’s wrath we were forbidden from entering into His rest, but we are reminded in Hebrews 4 that “we have a great high priest” who graciously allows us to enter into that rest again. In light of that, may we resist the temptation to find worth in our schedules. May we understand our identity as God’s image bearers and continue to pursue a posture of gratitude. May we celebrate God’s provision together. And may we – by grace through faith – “strive to enter that rest”, knowing that the work of the resurrection is finished. Margaret worked with the sales and marketing teams to export and analyze consumer market data in Nielsen’s database in 2014. She assisted the accounting department at Southeastern Mills this past summer by creating national and international reports for their recently acquired retail brand, Louisiana Hot Sauce. Margaret hopes to combine her economics background, experience with market research, and passion for writing in the business world. It is hard to believe that we are one month into the Trinity Fellows Program. There is already so much that we’ve learned. From working a 9-to-5 job, to listening to the cares and concerns of teenagers in Student Ministry, to mentoring elementary school children at Abundant Life, to listening to one another’s stories as a group of Fellows, to learning about culture making, gratitude, and the resurrection in our seminary classes—this year has been full of learning and overflowing with blessings. The Trinity Fellows Program has also brought up both past pain and future concerns; questions about faith, culture, and work; and how to live a godly life. As Fellows, we have already in this first month come face to face with our brokenness, and yet we have also come face to face with Christ’s faithfulness. The Trinity Fellows Program is like running a marathon. It will take endurance to keep up with this year; with such a full schedule and so many meaningful moments, we will need to treasure every opportunity for rest and solitude so that we can continue the race. Testimony Retreat in Deltaville, VA. Photo by Margaret Hjort. Recently, in times of reflection, I have often found myself drawn to Psalm 18:31-36. Verse 32 tells us that “It is God who arms me with strength and keeps my way secure.” Over the past year since leaving college, I have experienced the unsettling nature of adulthood. I have been unsure about my future, have been indecisive about my career path, and have overall been frazzled by the transition into the “real world.” In the face of all of this uncertainty, this passage provides me with hope. It tells me that God is on my side and steadies my steps. God will provide me—and all of us Fellows—with strength, especially in my moments of weakness (or even sheer exhaustion) this Fellows year. Although I am stretched, I rest secure. The devotional Our Daily Bread sums up this truth so well: “So often we need someone to watch over us, to guide and steady our day-to-day walk. And we have that someone – God our Father – who helps His children learn to walk, guides our steps, holds our hand, and keeps us on the right path.” For this truth I am incredibly grateful. This past week, I gave a presentation in Wade Bradshaw’s class, Issues in Contemporary Culture, on the pursuit of happiness. That pursuit is especially relevant for this year, as we all are trying to figure out what will bring us true happiness. We hope to find happiness in a career, in a community, in a place, in a future family. We are all on the brink of so many important life decisions. And we all desire to be happy: happy with ourselves, with our careers, with our friends and family, with our relationships with the Lord, and ultimately with our day-to-day lives. My hope is that with this year, we all can come to learn what it means to be truly happy. I hope we can rely on the Lord for our strength, and take comfort in the fact that God arms us with strength and leads us in the way everlasting. The Trinity Fellows Program is just one step forward on that path. There are so many things that we have learned thus far, and so many more to come. I am encouraged that Christ holds us and makes our paths secure, and God watches over us every step of the way. Praise the Lord for His faithfulness! Anna grew up in the DC metropolitan area and has a background in systems engineering, psychology, and anthropological studies. While at UVA, she was involved in Intervarsity and was on the chapter’s outreach team. She also participated in the Cava- lier Marching Band and volunteered with Madison House, a philanthropic nonprofit, as a teacher’s assistant. In 2014 Anna did part of El Camino de Santiago, a 500-mile hike across northern Spain. Since graduation, she has worked as both a product manager and a teacher and is contemplating a career in education. Each week during the 2015-2016 Fellows year, we will feature reflections from the Fellows class of 2016. This week's reflection comes from Brittany Fan (Blacksburg, VA - UVA). Sunrise in Deltaville, VA. Photo by Brittany Fan. Last Thursday, during our seminary course titled “Issues in Contemporary Culture,” Dr. Wade Bradshaw taught us about the importance of gratitude. He suggested that our knowledge and belief of the Gospel necessitates the cultivation of gratitude within our hearts. We have an endless supply of things to be grateful for, yet we often find ourselves anxious, frustrated, or prideful, rather than humbling ourselves in thankfulness to our Lord, and by extension, thankfulness for His creation and for the people around us who bear His image. That same night, our Fellows class departed for Deltaville, VA for the Fellows testimony retreat. Having been told by Dennis, our Fellows director, that we were going to one of the most beautiful places on earth, I went in brimming with excitement not only to hear others’ stories, but also to be surrounded by the outflow of God’s creative work. Despite our late arrival in Deltaville and our even later bedtime, I woke up with the sunrise on Friday morning. As a morning person, I knew that any effort to return to sleep was likely to be futile, so I embarked upon a wandering journey to explore this unfamiliar and supposedly beautiful place. And beautiful it was. As an artist, much of my work stems from gratitude and awe of creation. The outdoors have always been a source of nourishment for my soul. Each experience in nature brings with it a new sense of joy, and on this particular morning, that joy came from something unexpected—something so insignificant in the greater scheme of the landscape and yet still so magnificent in its own scale. 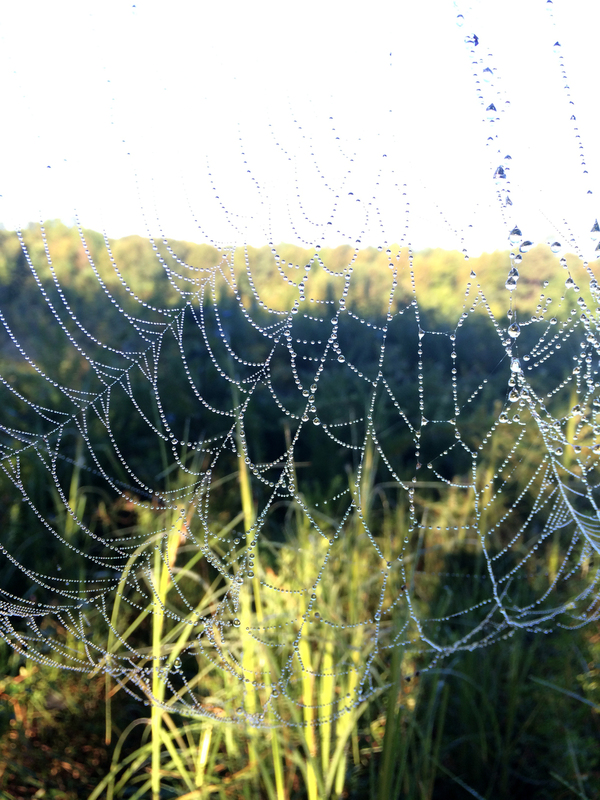 That morning, my personal cultivation of gratitude was rooted in the contemplation of spider webs. 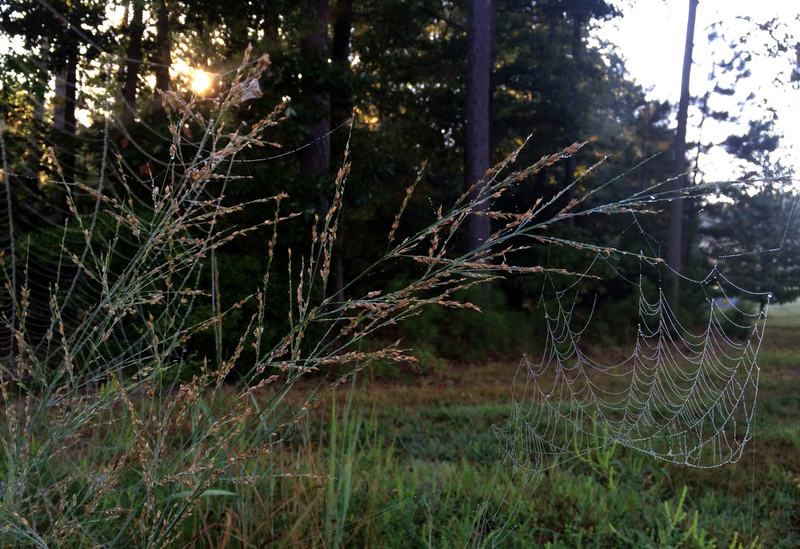 In looking at these beautifully spun, dew-lined threads, my mind quickly went to a passage in Luke 12. “Consider the lilies, how they grow: they neither toil nor spin, yet I tell you, even Solomon in all His glory was not arrayed like one of these. 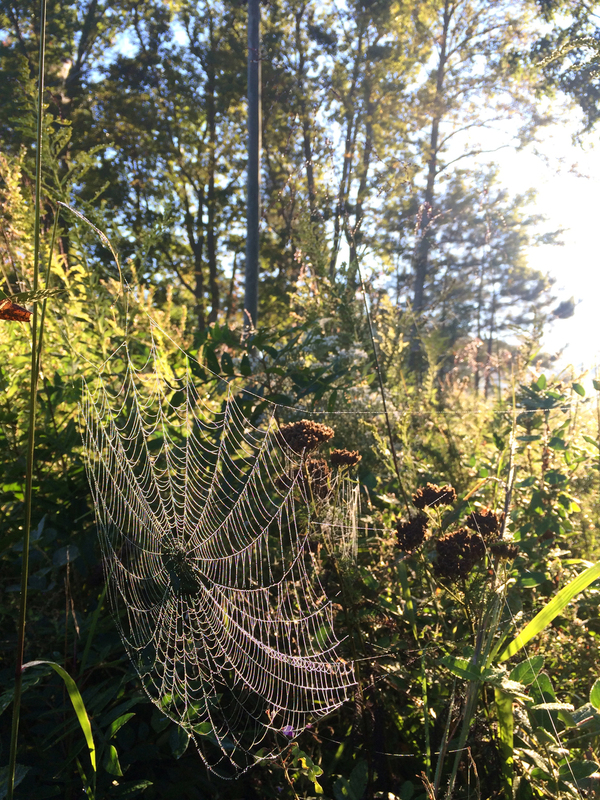 But if God so clothes the grass, which is alive in the field today, and tomorrow is thrown into the oven, how much more will he clothe you, O you of little faith!” Spiders create these intricate weavings daily. It is their given task within their small realm of reality; a task done purely for survival and function, yet that culminates in beauty. If the Lord can make this small, mundane task a manifestation of His glory, how much more potential does He provide for us as humans, the bearers of His image? We have the capacity to create and to cultivate as stewards of all creation, and the ability to participate in good, fruitful work that goes beyond what is necessary to fulfill our own personal, fundamental needs. 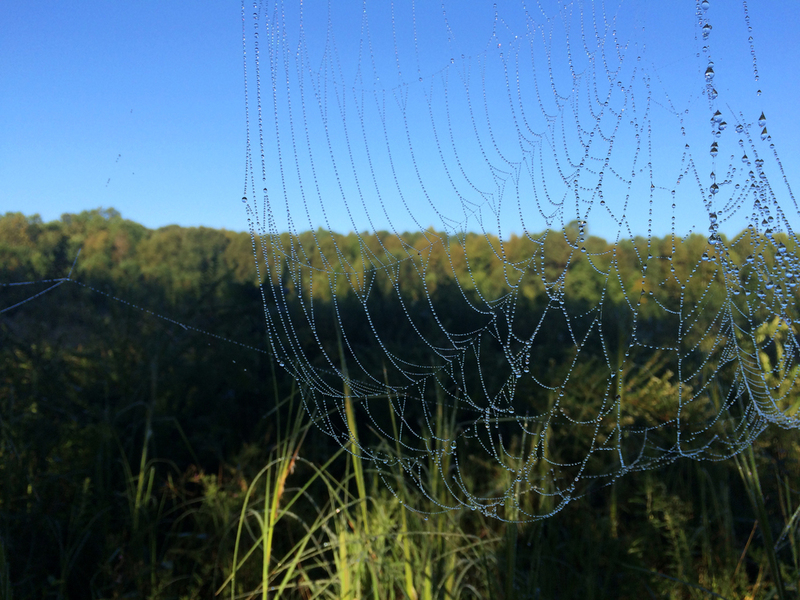 As strange as it may sound, the spider webs reminded me of God’s desire to use us even in our broken and flawed states, and the fact that he gives us power to manifest His glory in unexpected ways. It also humbles me to consider that, like the spiders, we are limited as fallen humans in the scope of that power. But in our weakness and finitude, we are not to give up, but rather do our work diligently in whatever place and task the Lord has called us to. What a gift and privilege that is. This year, we as Fellows will explore this very notion of work and vocation so that we may better grasp what it means to follow God’s calling in every aspect of our lives. We will have the opportunity to do so within a community that is characterized by rich vulnerability, Christ-like love, and the collective desire to seek and glorify God. We are moreover blessed with the support of countless mentors, job hosts, host families, friends, and a beautiful Church body that seeks to love us and cultivate within us a deep love for the world. In a way, the Fellows community is a beautifully spun web, another manifestation of God’s goodness and a wonderful illustration of building God’s Kingdom. What a multitude of things to be thankful for. And to think, it all began with staring at spider webs in a field. If we simply take a moment to look at the world around us, we can discover so many reminders of our Lord’s faithful presence. I am grateful for those spiders, for their toil, and for our ability to enjoy their work and other expressions of our Father’s creativity. I am grateful for grasses in the fields, for the sparrows in the sky, and for God’s ever-greater desire to clothe us and tend to us as well. I am grateful for the fifteen young men and women that I have the joy of walking alongside this year, and for the generations of community members who make it all possible. I am grateful for God’s grace to us and His desire to see His Kingdom flourish. From the smallest of creatures to the grandest of God’s visions, I see so many opportunities ahead to express gratitude in our daily walk with the Lord. Praise be to our good, good Father. As a visual artist, Brittany received five arts grants while at UVA, shows work in local coffee shops, sells paintings and cards through a Charlottesville retailer, and has upcoming art exhibition with New City Arts this fall. Using painting, photography, and graphic design, she has supported organizations such as International Justice Mission and Soddo Hospital in Ethiopia. Brittany also loves to teach and work with children, and has done therapy for infants affected by Down Syndrome, taught in elementary schools and summer programs, and directed a daycare volunteer program while in college. 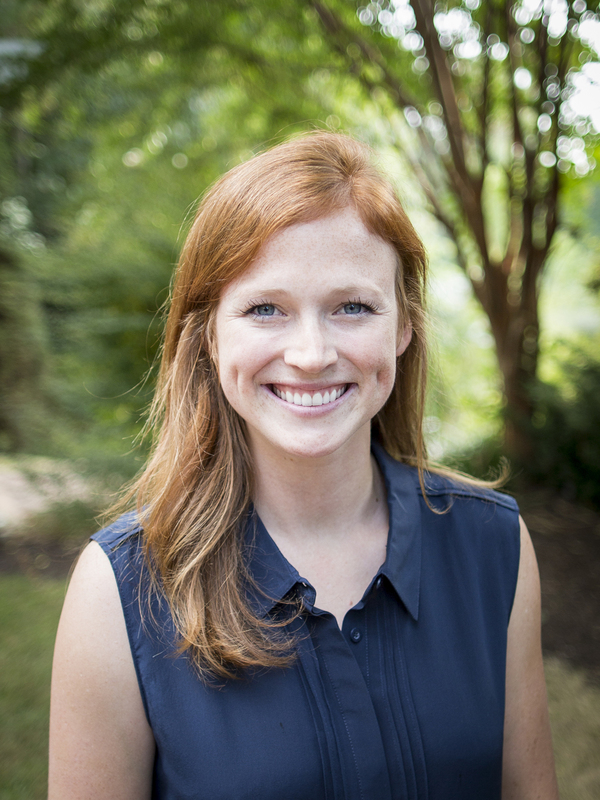 She served on the executive board of UVA’s College Council, interned at the Center for Christian Study, led as InterVarsity’s Creative Director, and has invested in areas such as education, disaster relief, and housing in lower income neighborhoods and developing countries. More than anything else, she desires to use her gifts and passions to help the world better flourish.